Barbara Young, daughter of the distinguished journalist and author Gordon Young who was Reuters’ Chief Correspondent during World War II, is a national newspaper and magazine editor, journalist and ghostwriter with more than 30 years’ publishing experience. Born in Paris and educated in Europe and England, Barbara is a lifelong animal lover and supporter of animal welfare. Barbara first found out about the Soi Dog Foundation while seeking advice on how to rescue a sad, badly injured street dog found in Lumpini Park, Bangkok, while on holiday in 2010. Together with help from a local SDF volunteer, the dog received urgent veterinary treatment and recovered, which led Barbara to plan a visit the charity’s HQ in Phuket. Here she came across the remarkable story of the charity’s founders resulting in working with John Dalley to produce his wife’s memoirs Just Gill, which will be published by Victorina Press in 2019. When not writing, Barbara enjoys spending time with her dogs and horses, as well as training and competing in dressage. John Dalley is a founding member of the registered charity and non-profit organisation Soi Dog Foundation together with his late wife Gill and Margot Homburg when setting up in Phuket, Thailand in 2003. The Foundation is now officially registered in eight countries. John is President of Soi Dog International. 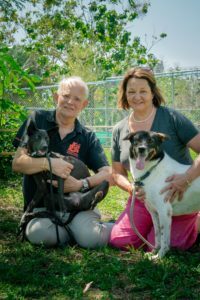 A former chemical plant manager from Leeds, and Gill, a former bank manager, retired to Phuket in 2003 with the aim of helping stray and abused dogs and cats in the province which they had come to love. Gill was the first non-Asian to be named Asian of the Year by CNA Singapore. The Dalleys also co-founded the Asia Canine Protection Alliance, which worked to end the illegal trading of canines for the dog meat industry from Thailand to Vietnam. They are recipients of awards for services to animal welfare including the prestigious Jeanne Marchig award in 2011. John assisted the government in the drafting of Thailand’s first animal welfare bill, which was passed in 2014, making the consumption of animals not considered livestock illegal, and introducing penalties for cruelty to animals. In early 2017, Gill died after a short battle with cancer, but John continues to volunteer his services to ensure the legacy lives on. Currently Soi Dog Foundation sterilises more dogs and cats than any other organisation in the world, and treats thousands more each year at its facilities in Phuket and Bangkok. This book and CD is a unique resource for early years settings, practitioners and musicians specialising in early years to support the development of children’s speech and language skills through music. Within the book and CD, you will find 20 original songs, all highly accessible and engaging for children adults alike, with clearly structured guidance on activities to develop speech and language, musical skills and other key learning areas. It links with the National Curriculum’s Early Learning Goals and other internationally recognised early years approaches and can be integrated easily into the daily routines of your setting or nursery. The programme has been specifically designed to address deficits in this critical area of early years development which is shown to improve long-term personal, social and educational outcomes. Using an evidence-based approach Musiko Musika has worked with speech and language consultant Helen Ayres to develop the songs and piloted the activities with over 2,000 children. We want all children to have the voice to express who they are and communicate effectively. A high-quality early intervention like this can have a life-changing impact for children. Training is also available for nursery staff and other practitioners.